Any company using EOS to achieve Vision, Traction, and Healthy in their business knows that part of that journey is discovering the Core Values that define your culture and then hiring, recognizing, rewarding, celebrating, and occasionally terminating people based on whether they live your Core Values or not. After our 1st Quarterly Company Meeting where we did our Core Value Speech, we highlighted our Core Values in the Monthly Newsletter. We had our 2nd Quarterly Company-wide Meeting (now called Quarterly Pow-wows) in July and followed up our Core Value Speech from the first meeting with recognition for those that showed our Core Values over the last 90 days. 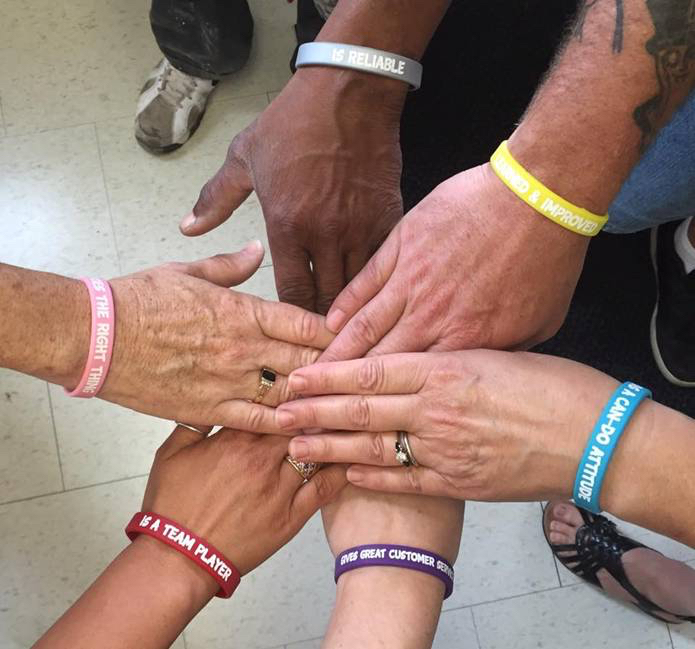 We have different colored wristbands – one for each Core Value. I put out an email to all of our senior- and mid-level managers asking for examples of coworkers showing our Core Values. By the time the meeting was held – I had a wristband for EVERYONE in the company! It was great telling the example and then saying who did it. Some examples were so prevalent that everyone guessed who it was before I announced the name. You can only earn one wristband color. So, in other words, doing the same thing over and over will gain you recognition – but not a wristband. Every time someone earns a wristband, their name is put into a hat. At the one year mark (July meeting, 2017), we are giving a Grand Prize to whoever’s name is pulled from the hat. What I find intriguing is that this client managed to find a way for people to call out Core Values in a way that is natural and supportive of their culture. No one likes to draw attention to themselves (at least most don’t). Not all of us have managers who remember to do so. So why not enlist everybody and do it in a way that is permanently showcased on everybody? How Can I Learn About This? What are you doing to define your culture? To attract people who fit and repel people who don’t? If you want to learn more about this concept, read the Harvard Business Review article, Making Your Values Mean Something. You can also order it here. To learn how we teach our clients to discover their values, read Get A Grip. See pages 116-129. Download a copy of the EOS V/TO™ to help you identify your company's Core Values. Read the ebook Decide! to learn how to make better business decisions in real time. This article originally appeared on the Coherent Coaching blog on September 26, 2016.